Homeownership fell to 65.9%, according to a recent US Census Bureau report (pdf). This number marks a 13 year low for US homeownership rates. The chart below represents inflation-adjusted house prices, using data from the Federal Housing Finance Agency house price index. 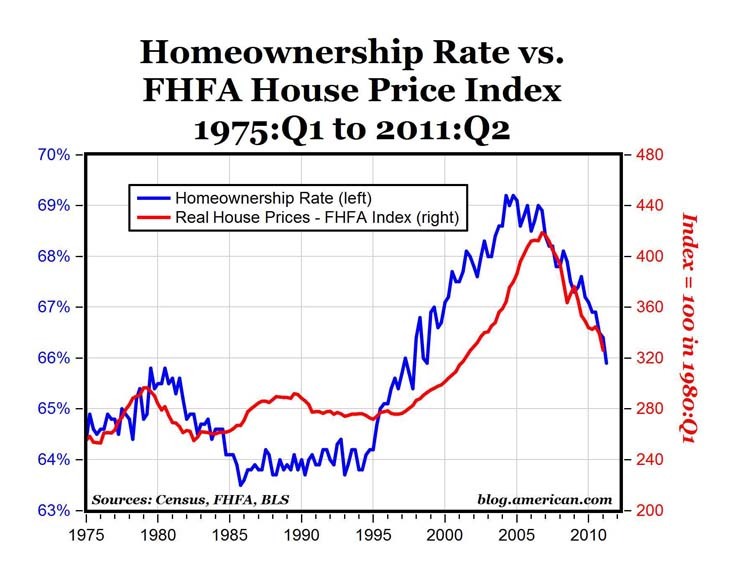 Housing prices still haven’t stabilized and there is much debate about when that will happen. However, more interesting to me is the discussion surrounding the merits of homeownership and whether or not it has lost its allure. One of the most notable voices in this discussion is hedge fund manager and author James Altucher. His post “Why I Am Never Going to Own a Home Again” is worth reading. Of all of Mr. Altucher’s reasons against homeownership it’s diversification that strikes a chord with me. No diversification. For most people, a house is by far the largest part of their portfolio and greatly exceeds the 10% of net worth that any other investment should be. Long periods of growth in the real estate market (as with any asset class) can make someone immune to the risks they’re taking by over weighting their portfolio. Sometimes it takes a great crisis for people to sober up to this risk.